The farthest confirmed galaxy observed to date, identified in this Hubble image of a field of galaxies in the CANDELS survey (Cosmic Assembly Near-infrared Deep Extragalactic Legacy Survey). The WM Keck Observatory obtained a spectroscopic redshift (z=7.7), extending the previous redshift record. 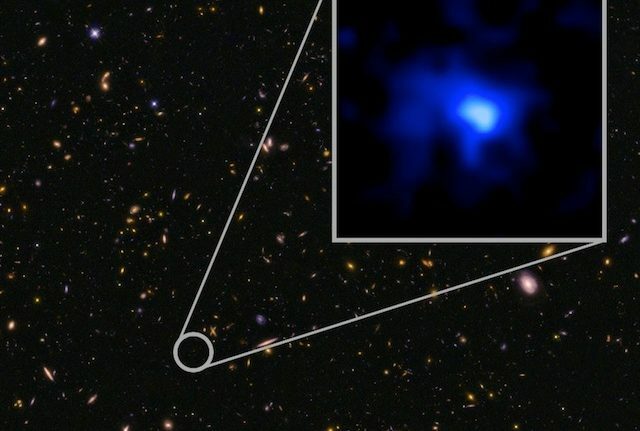 This is the most distant confirmed galaxy known, and it appears to also be one of the most massive sources at that time. The inset image of the galaxy is blue, suggesting very young stars. An international team of astronomers, using the powerful MOSFIRE instrument on the 10-metre Keck I telescope at the WM Keck Observatory in Hawaii, has confirmed the most distant – and therefore the oldest – galaxy ever measured. The team discovered an exceptionally luminous galaxy more than 13 billion years in the past and has finally determined its exact distance from Earth. Effectively, we have been able to look back to when the Universe was only five percent of its present age. The findings are being published in Astrophysical Journal Letters. The galaxy, EGS-zs8-1, is one of the brightest and most massive objects in the early universe and was originally identified based on its particular colors in images from NASA’s Hubble and Spitzer Space Telescopes. “While we saw the galaxy as it was 13 billion years ago, it had already built more than 15 per cent of the mass of our own Milky Way today,” said Pascal Oesch of the Yale University, the lead author of the study. “But it had only 670 million years to do so. The universe was still very young then.” The new distance measurement also enabled the astronomers to determine that EGS-zs8-1 was still forming stars very rapidly, about 80 times faster than our galaxy today. Only a handful of galaxies currently have accurate distances measured in this epoch of the Universe and none younger than this. The discovery was only possible thanks to the relatively new MOSFIRE instrument on the Keck I telescope, which allows astronomers to efficiently study several galaxies at the same time. Measuring galaxies at these extreme distances and characterising their properties is a main goal of astronomy over the next decade. These new Keck Observatory, Hubble, and Spitzer observations together also pose new questions. They confirm that massive galaxies already existed early in the history of the Universe, but that their physical properties were very different from galaxies seen around us today. Astronomers now have very strong evidence that the peculiar colors of early galaxies seen in the Spitzer Space Telescope images originate from a very rapid formation of massive, young stars, which interacted with the primordial gas in these galaxies.